Chilaboo Omega+ Bones Strengthens immune system and improves shiny coats. OMEGA+ chews contain as much as 20% of the meat and skin of salmon, which is the best source of highly saturated, fatty acids. We also added turmeric which counteracts inflammation and reduces the risk of heart disease. Scoop of spinach provides your dog with valuable antioxidants, potassium, iron, and folic acid . It is a great treat in between the meals. 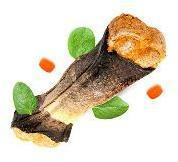 Nutrition Rawhide 77%, Salmon meat 15%, Salmon hide 5% Spinach 3%, Turmeric 1%. Analytical constituents Crude protein 81.4%, Crude oils 2.8% Crude fibre 0.6% Crude ash 2.8%, Omega-3 fatty acids 0.2% Omega-6 fatty acids 0.2%. All dogs need to chew. All dogs have to chew few hours a day. It’s a natural instinct. Chewing can provide your dog stimulation and help relieve anxiety. Especially with puppies, treats like rawhide bones can be a great substitute for your leather shoes and the legs of the dining room table.